For other Grammy Award categories, see List of Grammy Award categories. The award was first presented to Audrey Hepburn and producers Deborah Raffin and Michael Viner in 1994 for the album Audrey Hepburn's Enchanted Tales. Its last winners were the artists, producers, audio engineers, and audio mixers who contributed to the album Julie Andrews' Collection of Poems, Songs, and Lullabies in 2011, when it was announced the award would be combined with the Grammy Award for Best Musical Album for Children to form the Grammy Award for Best Children's Album. Tom Chapin and producers Arnold Cardillo and David Rapkin, and audio engineer-musical director Rory Young hold the record for the most wins in this category, with a total of three. Artists Bill Harley and Jim Dale, along with audio engineer David Correia, are the other musicians to win the award more than once, all winning it twice. 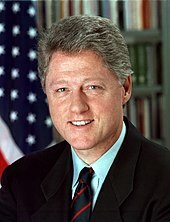 Former U.S. President Bill Clinton has also won the award, along with Mikhail Gorbachev and Sophia Loren, for their work on the album Wolf Tracks and Peter and the Wolf at the 2003 installment of the awards. Toni Morrison – Who's Got Game? The Ant Or The Grasshopper? The Lion Or the Mouse? Poppy Or the Snake? "Past Winners Search". National Academy of Recording Arts and Sciences. Retrieved September 11, 2011. Note: User must select the "Childrens" category as the genre under the search feature. ^ "Overview". National Academy of Recording Arts and Sciences. Archived from the original on October 27, 2009. Retrieved October 10, 2010. ^ "Explanation For Category Restructuring". National Academy of Recording Arts and Sciences. Retrieved September 11, 2011. ^ "Hundreds Nominated For Grammys". Deseret News. Deseret News Publishing Company. January 10, 1994. p. 6. Retrieved July 13, 2010. ^ "The 37th Grammy Nominations". Los Angeles Times. Tribune Company. January 6, 1995. p. 4. Retrieved July 13, 2010. ^ "The Complete List of Nominees". Los Angeles Times. Tribune Company. January 5, 1996. p. 4. Retrieved July 13, 2010. ^ "The Complete List of Nominees". Los Angeles Times. Tribune Company. January 8, 1997. p. 4. Retrieved July 13, 2010. ^ "1997 Grammy Nominees". Orlando Sentinel. Tribune Company. January 9, 1998. p. 3. Retrieved July 13, 2010. ^ "Academy's Complete List of Nominees". Los Angeles Times. Tribune Company. January 6, 1999. p. 5. Retrieved July 13, 2010. ^ "Final Nominations For The 42nd Annual Grammy Awards". Billboard. Nielsen Business Media, Inc. 112 (3): 72. 2000. Retrieved September 11, 2011. ^ Boucher, Geoff (January 4, 2001). "Grammys Cast a Wider Net Than Usual". Los Angeles Times. Tribune Company. Retrieved September 11, 2011. ^ "Complete List Of Grammy Nominees". CBS. January 4, 2002. Archived from the original on October 10, 2003. Retrieved March 19, 2011. ^ "Complete list of Grammy nominees; ceremony set for Feb. 23". San Francisco Chronicle. January 8, 2003. p. 5. Archived from the original on September 9, 2012. Retrieved March 19, 2011. ^ "Grammy Award Winners". The New York Times. The New York Times Company. 2004. Retrieved March 11, 2011. ^ "Grammy Award nominees in top categories". USA Today. Gannett Company. February 7, 2005. Retrieved March 19, 2011. ^ "The Complete List of Grammy Nominations". The New York Times. The New York Times Company. December 8, 2005. p. 2. Retrieved March 20, 2011. ^ "Complete list of Grammy nominees". San Francisco Chronicle. Hearst Corporation. December 8, 2006. p. 5. Archived from the original on September 9, 2012. Retrieved March 20, 2011. ^ "The Complete List of Grammy Nominees". The New York Times. The New York Times Company. December 6, 2007. Retrieved March 20, 2011. ^ "The 51st Annual Grammy Awards Nominations". CBS. Archived from the original on February 14, 2009. Retrieved September 10, 2011. ^ "Nominees And Winners". National Academy of Recording Arts and Sciences. Retrieved March 20, 2011. ^ "53rd Annual Grammy Awards nominees list". Los Angeles Times. Tribune Company. Retrieved February 20, 2011.